A look back at the history of the Royal York Hotel, which is now up for sale. <b>View of Royal York Hotel, 1986. City of Toronto Archives, Fonds 200, Series 1465, File 401, Item 7.</b><br><br /> The hotel has undergone many changes since this photo was taken. A multimillion dollar series of renovations overseen by architect Eb Zeidler was undertaken in the late 1980s and early 1990s to restore features such as marble pillars in the lobby, which were covered up during the 1970s. Labour relations have been tense at times. The rooftop garden <a href=”http://www.thestar.com/news/gta/2008/06/05/royal_york_rooftop_garden_a_hive_for_bees.html”>added beehives</a>. 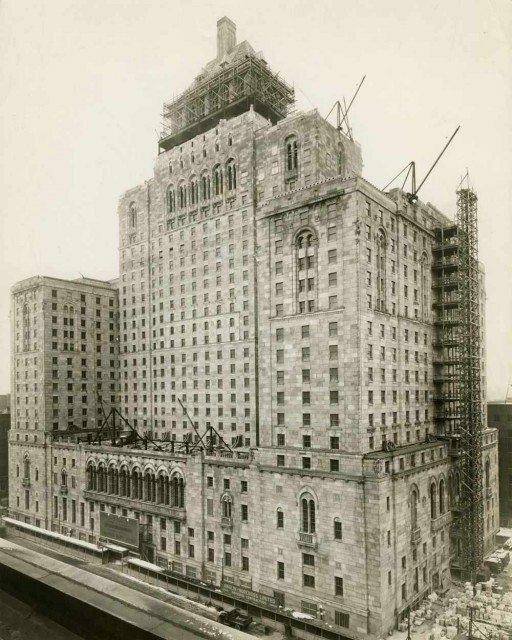 As the 21st century began, the breakup of Canadian Pacific led to the hotel’s rebranding as the Fairmont Royal York. Ownership changes in the mid-2000s led to the involvement of the Caisse de dépôt et placement du Québec. In the 1950s, or so the story goes, a writer meeting a friend in the lobby of the Royal York Hotel was heard to comment, “I can’t afford to eat here. I just wanted to catch the flavour of confidence and assurance, so I decided to come in and absorb some atmosphere. I just like to sit here and think that everyone I see is either important, romantic, or notorious.” In saying this, the unnamed writer managed to sum up the image and character the hotel has been crafting since it opened on June 11, 1929. Less than two weeks before the Royal York’s 85th anniversary, news broke that the building is up for sale. Although it’s obviously too early to say what changes the new ownership will bring, this provides us with an opportunity to review the changes the hotel has undergone throughout its long and storied past. Please don your snappiest formal wear before heading into the gallery. Additional material from the February 3, 1927, May 12, 1928, August 22, 1928, June 12, 1929, and May 27, 1932 editions of the Globe; the March 10, 1953, April 1, 1954, June 11, 1954, November 21, 1956, February 21, 1959, December 3, 1971, and April 26, 1971 editions of the Globe and Mail; and the July 8, 1927, June 8, 1929, June 11, 1929, June 12, 1929, November 24, 1956, March 6, 1971, September 25, 1971, and March 3, 1989 editions of the Toronto Star.